architecture | and sure stars shining . . .
From the boat on Monday, some of the better shots . . . .
Sears Tower, as it shall forever be known. This entry was posted in Photography for fun, Travel 2018 and tagged architecture, Chicago, sabbatical, travel, Yufei on October 26, 2018 by Jeffrey Carter. The view from the Marble Hall. The Upper Belvedere in Vienna is the home of centuries of Austrian painting and arts. I spent an afternoon there on Thursday. And what a lovely afternoon it was. The Baroque Belvedere palaces, Prince Eugene of Savoy’s summer residence, were designed by Johann Lucas von Hildebrandt, one of Central Europe’s greatest Baroque architects. (Prince Eugene was a big military genius who was the second most important person in Austria, after the Emperor.) 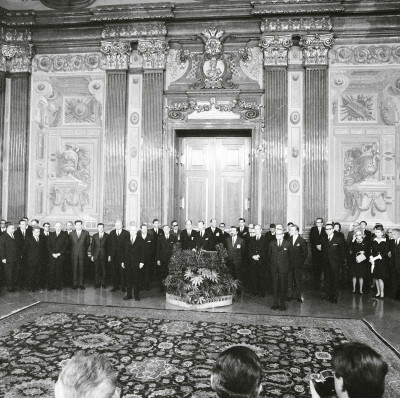 Flash forward to 1955, and the treaty that returned Austria to an independent state was signed in the Marble Hall; and to 1970, when the SALT talks between the USA and USSR were held in the Marble Hall. I walked in that very hall today. The museum is justly famous for its collection of Gustav Klimt. The entire collection is thoughtfully displayed and coherent in these grand rooms. Details of lanterns on the grand staircase. On the grand staircase landing. This entry was posted in Great Artists, Travel 2018 and tagged #Euro18, #worldtraveler, architecture, art, paintings, sculpture, travel, Upper Belvedere, Vienna on July 20, 2018 by Jeffrey Carter. The Great Hall of the Austrian National Library is a Baroque wonder. Built by Emperor Karl VI in the 1700s, it has survived the empire, the Nazis, and the tourists. And it’s stunning. My visit on Thursday could have lasted hours. Facing the center of the hall is the extraordinary collection from military hero and aesthete Prince Eugene of Savoy, who built the Belvedere as well. Manuscripts of Mahler (top) and Bruckner. This entry was posted in Travel 2018 and tagged #Euro18, #worldtraveler, architecture, Austrian National Library, books, travel, Vienna on July 20, 2018 by Jeffrey Carter. The view upon leaving the Art Institute on Sunday. Most any trip to Chicago includes some time at the Art Institute of Chicago, called by some the greatest museum in the world. I never tire of the Impressionists, of the miniature rooms, of the great masters, of the architecture collection, of the paperweight collection. This trip included the America After the Fall exhibition, the collection of modernist chairs, and some Napoleon stuff. And my old friends Messrs. Seurat and Monet. Edward Hopper, 1939. New York Movie. This painting is filled with incredible suggestive detail. I loved the symmetry of the view: a visitor and the painting he observes. Edward Hopper, 1940. Detail of Gas. Alice Neel, 1935. Detail of Pat Whelan. Charles Sheeler, 1931. Classic Landscape. Thomas Hart Benton, 1938. Cradling Wheat. Thomas Hart Benton, 1938. Detail of Haystack. Grant Wood, 1932. Daughters of Revolution. Paul Cadmus, 1934. The Fleet’s In. Notice the prim lady at the left, and her dog. Paul Sample, 1933. Church Supper. I love the sly glances at the lady in pink. This entry was posted in Travel 2016 and tagged Alice Neel, American Gothic, architecture, Art Institute of Chicago, Edward Hopper, Grant Wood, Thomas Hart Benton, vacation on September 6, 2016 by Jeffrey Carter. Today was a full-day excursion to Wells Cathedral in the sleepy little city of Wells, not far from Bristol. I toured the Cathedral, spent some time shopping (new shoes! ), had a small picnic lunch on the walk by the moat, then rehearsed and sang Evensong. Dinner completed the long day, at around 9.30 p.m. tonight. Wells is a beautiful cathedral, and I took many photos today of the 650+ year-old stone work. Bristol was bombed in the WWII. It’s not the prettiest city. From my hotel room this morning. This cherub in the Wells cloister is looking rather boored. John and Leona with the widow of the composer whose music we sang today. This entry was posted in Choral Music, Episcopal Church, Travel 2013 and tagged architecture, city of wells, cloister, evensong, Wells Cathedral on July 18, 2013 by Jeffrey Carter.